Unless otherwise noted, all quotations of Scripture are according to the ESV. This week’s lesson focuses on a short passage in James in which believers are exhorted to conduct themselves with humility towards others (especially with our speech) and also humility towards God, understanding that He is sovereign over our lives. James’ arguments in this passage draw on the notions of God as lawgiver and judge. Seventh-day Adventist (SDA) doctrine (represented by the 28 Fundamental Beliefs and the published writings of Ellen G. White [EGW]) presupposes a particular, unbiblical view of law and judgment, and this shows itself in some of this week’s Sabbath School (SS) lessons. According to the biblical storyline, God gave a body of law to national Israel by his mediator, Moses, as part of a covenantal relationship. The particular commandments of this law are spread out over several of the Old Testament (OT) books, but the actual covenant documents were the tablets of stone on which the 10 Commandments were written. Provisions for disobedience via a sacrificial system were included as part of the covenant relationship. As is described in several New Testament (NT) books, this covenant (termed the “Old Covenant”) was given by God temporarily, until a newer, better covenant was made. This New Covenant, anticipated most explicitly by the prophet Jeremiah (see Jeremiah 31:31-34), was inaugurated by Jesus Christ, whose incarnational ministry was representative of the Kingdom of Heaven entering the world and whose once-for-all sacrifice on the cross provides forgiveness for anyone who would repent and believe in Him. God also gives the Holy Spirit to believers, giving them spiritual life and transforming our character, or to paraphrase the language of Jeremiah “putting His law in our minds and writing it on our hearts.” By living a perfect life under the Old Covenant law and bearing the curse of the Old Covenant law on behalf of anyone who would believe in him, Jesus fulfilled the OT scriptures, and therefore believers are to understand and relate to Old Covenant law in light of Christ’s fulfillment. Rather than being bound to Old Covenant law, one could say that believers are under the “Law of Christ” or “Christ’s Torah.” Many moral principles are binding on believers, which we are able to read in the NT, and find expression in the Old Covenant commandments as well, though a comparison between the Testaments many requirements of Old Covenant law have been set aside. Any sort of external religious ritual, such as day observance or dietary choices, is explicitly relegated to the consciences of individual believers, whether or not it once was a part of Old Covenant law. Since “keeping Jesus’ commandments” is linked to loving Jesus, this verse provides powerful rhetoric encouraging observance of the 10 Commandments. However, a more careful study of the context and the NT writers’ (especially John) use of the Greek term for “commandment” reveals that Jesus is talking about all of his teachings in his earthly ministry, very likely with a particular focus on his instruction that his disciples should “love one another as I have loved you” (John 13:34). This is only a high level summary of issues related to understanding the laws and the covenants. Additional resources for this topic are listed at the end of this article. It would be safe to say, then, that the “law of liberty” is the “law of Christ,” which for a Jew would simply have been the Torah fulfilled in Christ and understood in terms of the New Covenant. Chief among the concerns for believers, then, is their own faith in Jesus to save and empower them, which works itself out in love. The believers, who were heirs of the kingdom (2:5), following the teachings of Jesus (Matthew 5:43-48, 20:34-40), would have the “royal law” (literally “kingdom law,” 2:8, to love one’s neighbor as oneself) first and foremost in their minds. The SS author rightly picks up on James’s argument against speaking evil against a brother. To do so would be (a) to fail to love them and (b) put ourselves in God’s place, who alone is judge. However, note that the SS lesson uses terminology (“keeping the law”) which is not typical usage by NT writers when discussing normal Christian life, though is very common in the OT. The term “keeping” is used commonly in the NT when exhorting believers to obedience, but it almost always refers to keeping the commandments of Jesus. As in John 14:15, the emphasis on “keeping commandments” is remembering and observing what Jesus taught in his earthly ministry, not a reference to the Old Covenant law, much less to the 10 Commandments in particular. Rather, the NT authors understood that they were no longer “under the law,” insofar as the Old Covenant had passed away, and therefore they commonly used language to emphasize this transition. “Bearing fruit in the Spirit,” “putting off the old man” / “putting on Christ,” “walking in the light,” keeping the commandments of Jesus” (vs “keeping the law”). 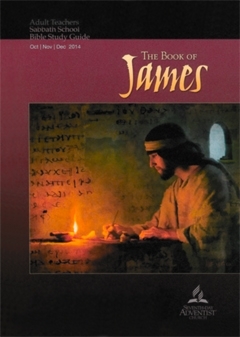 James’ argument in 4:12 is not so much that: because Jesus gave the Old Covenant law to the Israelites, he alone is qualified to be judge, but rather he is continuing and clarifying the point he made in 4:11: because speaking evil of others is itself breaking the law (failure to love others), one who does so is setting oneself above another person as well as above God, who by his own authority as judge of the world has given the law. The SS lesson addresses the correct argument in the Sunday lesson and in the notes, but in today’s lesson it draws the focus away from this argument to insert SDA presuppositions about Jesus’ relationship with the law. It is certainly orthodox to say that the comings and goings of Yahweh in the OT were comings and goings of preincarnate Jesus. So, in that sense, Jesus certainly is the lawgiver, just like he, as God, is the source of all scripture (2 Timothy 3:16). However, it is common SDA teaching to put an unwarranted emphasis on this point of doctrine, which creates good rhetoric to try and draw a strong continuity between the obligations of OT Israel and the NT church. Such rhetoric, however, presupposes that, as God, Jesus would not give laws to national Israel that would be in effect only as long as the Old Covenant was in effect. The SS lesson also makes the argument that Jesus is qualified to be judge, since he is the lawgiver. I am not aware of any scripture that makes this connection. Rather, scripture consistently makes the argument that Jesus incarnate received right to rule based on his self-sacrifice, taking the wrath of God on behalf of sinful humanity. Even the EGW quote makes this connection, without mentioning anything related to the law. Though the SS lesson does not broach this topic, it is good to ask the question: what is the nature of Jesus’s rule and his judging? Far from beginning a secret investigation begun 160 years ago, Jesus presently lives to make intercession for his brothers and sisters (Hebrews 7:25, 9:24), but will return in judgment on the Great Day of the Lord. That is very good news for anyone who would believe in him! The language used by the SS author in this section was a little restrained and muted, and so for the purposes of this commentary I want to correct a possible misunderstanding of the passage (though I do not think the SS author has this misunderstanding himself). The emphasis in James 4:13-17 is not so much on the wisdom and practicality of long-term vs short-term planning. It is rather a rebuke of the arrogant presumption that we might somehow live autonomous lives apart from the sovereign providence and pleasure of God. We do not merely submit our plans to God for a stamp of approval, but rather whatever we do whenever is to be actively done with the intention to please God and glorify Him. The end of the lesson seems to use language that is derivative of the SDA doctrine of conditional immortality, aka annihilation. That is: we are all by nature not immortal souls, but rather receive immortal life at the resurrection only if we are in Christ, and are otherwise annihilated, gone forever. This unfortunately does not take into account the weighty language used by Jesus and the apostles in describing the final judgment. Additionally, the doctrine is sometimes supported by woodenly literalistic interpretations of OT passages. Believers are able to rejoice during the pains in life not merely in spite of them, but rather because they are being used by God for our sanctification. This is in fact how James starts off his letter (James 1:2-4). Our problem is not that life is so short, unsatisfying, and unjust, but rather our sin has separated us from God, and we both cause and participate in the world system of injustice and unfairness, and because we are sinners, we die. If we trust in the substitutionary death of Jesus Christ, we are declared righteous and adopted into God’s family, and will be saved at the final judgment. Until then, we have the promise that God will use anything and everything, especially our sufferings and ultimately our deaths, for our good, and this is cause for rejoicing (Romans 8:28-32 & 14:8, Philippians 1:19-20). The SS author notes that many translations render 1 John 3:4 as “sin is lawlessness” rather than “sin is transgression of the law” (which comes from the KJV and related translations). The modern translations are actually more accurate—I could find no commentator or lexicon that supports the SS author’s claim that anomia refers to specific violations of the law. Rather, I found experts insisting that the principle of lawlessness, a settled opposition to any sort of law or authority, is being emphasized by the grammar and vocabulary of this verse. SDA teaching commonly invokes the KJV rendering of 1 John 3:4 to closely associate sin with “the law,” which it takes to mean the 10 Commandments. If each of the 10 Commandments are ontologically related to sin, the view that the 10 Commandments are all binding on all people at all times is strengthened. This view is part and parcel of the SDA Great Controversy worldview, of which the eternality and permanence of the 10 Commandments is a vital piece. If we rather listen to what the text says, what do we make of sin being identified with lawlessness? This is clearly shown in the biblical storyline. No matter what law or rule or command is given to sinners, we go astray. From the beginning, Adam and Eve did not have the Torah or even the Ten Commandments, just a simple command to avoid eating fruit from one tree, but sin still found a foothold. Paul recognized that sin was present without direct knowledge of the written Torah (though a certain echo of morality could be found on every human conscience, Romans 2:14-15), and that Old Covenant law was given to aggravate and reveal our already fallen condition (Romans 7:7-13). The SS author asks an interesting rhetorical question – how could anyone constantly do all the good they could possibly do in any given day? The answer seems to be “of course no one does everything they could do.” But according to James 4:17, that would be sin, since what good one could do has already been presupposed to be in one’s ability of being able to do. If we are not doing what we should be doing, we should repent! It is by beholding Christ that we are transformed, and in understanding the freedom that we have in him that we are truly able to love God and love others, with no fear of condemnation or disapproval by God. Because we are indwelled by the Holy Spirit, we are able to see the value of Christ and the mercies of God, and if we walk this way, we will naturally bear the spiritual fruit of love. Does that mean that we will not need sleep? God does not promise that, but rather He does promise us the gifts and fruit of the Spirit, by which we may live holy lives. If we find our rest in Christ, we’ll find that his yoke is easy, and burden is light. The remarkable privilege, blessings, and assurance of being adopted into God’s family, though you were once alienated from him in your sins, that you may turn away from cultivating worldly pursuits, and have a greater motivation to live your life and make your plans according to God’s will, trusting in his sovereign provision and guidance according to his Word (Romans 8:28-32, James 4:13-17). In the introduction to this quarter’s SS lessons, the author asserts that Martin Luther denied the inspiration of the Epistles of James, due to his perception of its theological inadequacies. However, the author asserts on the same page that Luther included it in the NT canon, though at the end. I could not find any reference to Luther denying the inspiration of James, and Luther’s inclusion of it as canonical militates against the idea that Luther thought it was inspired, by definition. Rather, I believe it would be more accurate to say that Luther had a “canon within the canon” view that placed other books that spoke more directly about Christ, ahead of James in interpretive priority. In later versions of his NT compilation (see the article by Timothy George below) Luther removed the infamous “strawy” assessment of James. See, therefore, how the SS author’s speculation about the effect Luther’s early opinions on James had on the Protestant church (speculation which is made without evidence), feeds into the SDA’s self-narrative of God calling a remnant to bring the church back on track, and doing so by employing the Spirit of Prophecy. I am not claiming that Luther or Calvin got it all right, but rather, I am pointing out that if one’s own opinion differs from another earlier, demonstrably incorrect opinion, that does not prove the truth of one’s own opinion, but rather begs the question. Note that Church of Jesus Christ of Latter-Day Saints makes a similar historical claim about itself. It teaches that the “Great Apostasy” occurred soon after the apostolic age, which lasted until the revelation given to Joseph Smith in 1820. Copyright 2014 BibleStudiesForAdventists.com. All rights reserved. Revised November 24, 2014. This website is published by Life Assurance Ministries, Camp Verde, Arizona, USA, the publisher of Proclamation! Magazine. Contact email: BibleStudiesForAdventists@gmail.com.